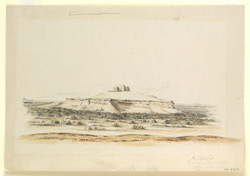 Water-colour painting of a hill near Sukkur Cantonment (Sind) by Thomas Studdert (1812-1855), 15th December 1840. Sukkur is situated in the centre of Sind province, Pakistan on the west bank of the River Indus opposite its twin town of Rohri. The town has traditionally been of military importance due its location at a strategic crossing point of the river. It was occupied by the British in the 19th century as it was part of their route to the Bolan Pass in Baluchistan. In 1845 however an outbreak of ‘jungle fever’ among the 78th Highlanders killed 500 men, women and children and the town was abandoned.